The cold wave tightened its grip on northern India as heavy snowfall in Jammu and Kashmir and Himachal Pradesh and widespread rain in the plains sent shivers down the region. North India reels under fresh bout of cold wave. 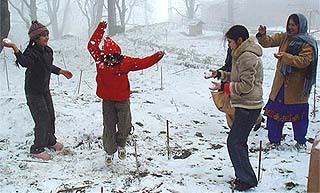 Tourists enjoy the snowfall at Kasauli on Saturday. Do you see Sania Mirza among the top 10 in the near future? In a far-reaching suggestion, the Chief Election Commissioner and one of the well-known votaries of electoral reforms T.S. Krishnamurthy today said that all the ministers, except a two or three holding important portfolios in each state, should resign as soon as the announcement for Assembly elections is made. In an effort to upstage the Left parties and project the Congress as the chief driver of the implementation of the UPA government’s common minimum programme (CMP), senior party office-bearers today urged Finance Minister P. Chidambaram to ensure that the next annual budget makes a strong political statement and reflects the government’s political will and the concerns of the “Aam Aadmi”. The Defence Minister, Mr Pranab Mukherjee, now in the city, has expressed concern over the fresh round of mortar attacks in Poonch sector from across the border, which he feared was bound to disturb the peace process between the two countries. In what appears to be a vindictive move, the Tamil Nadu police special investigation team probing the Sankararaman murder case today invoked the Goondas Act against Kanchi Mutt manager, Mr Sundersa Iyer and junior pontiff Sri Vijayendra Saraswati’s brother, Raghu, to detain them for a year without trial. Four persons travelling to Mumbai on the Golden Temple Express were arrested early this morning as soon as they alighted from the train. Popular Bollywood heroine of the late 1970s and early 1980s Parveen Babi was found dead at her suburban Juhu residence here today after a suspected drug overdose, the police said.